A new Heal Trigger and G Guardian appear that work in tandem with Neo Nectar’s same name tactics. AUTO Generation Break 1: [Counter Blast 1 & Choose 1 face-down G Guardian from your G Zone] When this card is placed on (GC), you can pay the cost. If you pay it, during that battle, this Unit gains Shield+5000, choose up to 1 card from your hand, Call it to (RC), and if the Called Unit has the same name as 2 or more of your Units, this Unit gains Shield+10000. Note: Kosterina appears to be a name of Russian origin. 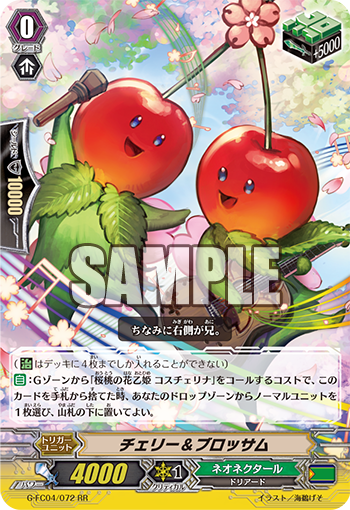 AUTO: When this card is discarded from your hand for the cost of Calling “Flower Princess of Cherry Blossom, Kosterina”, you can choose up to 1 Normal Unit from your Drop Zone, and place it on the bottom of your Deck. For Today’s Card, we’re introducing the following from “Fighter’s Collection 2017” (on sale May 12th, 2017): The Generation Break 1 《Neo Nectar》 G Guardian, “Flower Princess of Cherry Blossom, Kosterina” and the Heal Trigger “Cherry & Blossom” that activates its ability when it’s discarded from the hand for the Cost of Calling the related G Guardian. When “Flower Princess of Cherry Blossom, Kosterina” is placed on the field, you can pay 1 Counter Blast to have her gain Shield+5000! And by Calling 1 Unit from your hand to a Rear-guard Circle, if there’s 2 or more cards with the same name as the Called Unit, Kosterina gains an additional 10000 Shield. It’s possible for it to become a 30000 Shield in total, meaning this card on its own can ward off an opponent’s powerful attack. It also works well in tandem with “Ranunculus of Searing Heart, Ahsha” and “Ideal Maiden, Thuria”, if you Call a Unit with the same name as your Vanguard “Ranunculus of Searing Heart, Ahsha”, “Kosterina” gains Shield+15000 and you’ll be able to recover the Counter Blast you used as a Cost. Also, if you combine it with cards like “Faith Maiden, Odette”, you can increase the Power of your Vanguard during the opponent’s turn, alllowing you to reinforce your defenses. Continuing, we introduce “Cherry & Blossom” who can activate its ability when discarded from the hand for the Cost of Calling “Flower Princess of Cherry Blossom, Kosterina”! It lets you Choose 1 Normal Unit from your Drop Zone and place it on the bottom of your DKec. Since 《Neo Nectar》 has many cards the Call Units with the same name from the Deck, you can return cards in the Drop Zone back to the Deck to Call them next turn, letting you pull off your next move. Q. Can you discard “Cherry & Blossom” for the Cost of Calling G Guardians other than “Flower Princess of Cherry Blossom, Kosterina”? Q. Can you Call “Flower Princess of Cherry Blossom, Kosterina” while you have no face-up G Units? Q. When there are 3 face-up G Guardians in your G Zone, can you activate the effect of “Flower Princess of Cherry Blossom, Kosterina” by flipping a G Guardian face-up?